The 10 Best Milkshakes in Nebraska! Milkshakes are a classic dessert. This sweet, cold treat has been a staple since the 1920s. The best milkshake places in Nebraska not only offer up the classics and malted varieties but unique combinations unlike anywhere else! Here are the 10 best places to get a milkshake in Nebraska! Dairy Chef takes classic shakes to a whole new level. This old-school ice cream parlor serves delicious milkshakes in a variety of flavors, including chocolate, strawberry, vanilla, and more. For a soft serve milkshake, head to Dairy Twist in Bellevue. This neighborhood favorite turns out creamy shakes alongside made-to-order hamburgers, sandwiches, and fries. Springfield Drug may look like a drugstore, but don’t let that fool you. This old town pharmacy/convenience store also serves delicious ice cream treats and milkshakes at the original soda fountain located inside. At Ted & Wally’s in Omaha, you can choose to order a malt, freeze, or milkshake in any of the ice cream shop’s flavors of the day. All of the ice cream is made the old-fashioned way using rock salt and ice right on the premises. The eCreamery in Omaha is home to some of the city’s best ice cream and gelato. At the eCreamery, you can order a milkshake in any flavor of ice cream available that day. Stop in for an award-winning shake! Ivanna Cone in Lincoln makes their own ice cream rotating in new flavors all of the time. However, the star of the show is the milkshakes. These sweet, creamy, and tasty ice cream treats are an edible work of art. B&G Tasty Foods is an old-fashioned burger joint in Omaha with a family-friendly atmosphere and menu full of diner classics. However, a meal here wouldn’t be complete without one of their incredible milkshakes. From chocolate and Butterfinger to strawberry and butterscotch, there’s no shortage of flavors to choose from. Visit any day of the week and indulge in a tasty treat! The name says it all. At Angus Burgers & Shakes in Kearney, you can order any combination of a burger and shake and be certain it will be made fresh and taste delicious. 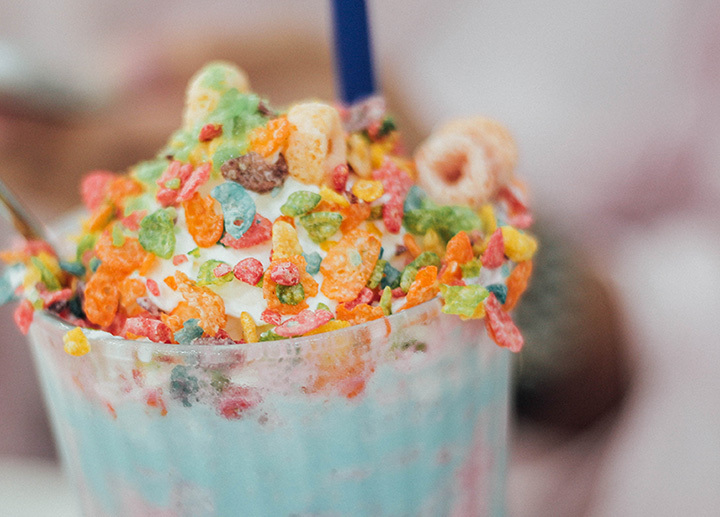 The menu includes unique milkshake flavors, such as Oreos and cream, and maple and bacon to satisfy any sweet tooth. This 1930s-style hamburger and hot dog joint also serves incredible milkshakes to accompany your meal. In fact, the milkshakes are big enough to share! Of course, only if you want to. Bronco’s Self-Service Drive In is another classic burger joint located in Omaha that serves delicious milkshakes in all of the classic flavors to accompany your burger. A visit to Bronco’s during the summer is a must-do if you’re in Omaha!